Face the raised pull-up/chin-up bar, and, if necessary (due to bar height), either using a small stool or jumping, grasp the bar underhand (palms facing the body) at the desired width (traditionally a roughly shoulder-width or slightly wider grip is preferred for this exercise) and hang. Inhale and pull the chest to the bar, keeping the body upright and puffing out the chest. The elbows should be pointing more-or-less forward. Slowly lower the body to the starting position, letting the arms fully extend (without letting the elbow joint slam as the arms are straightened), while exhaling throughout the negative motion. Repeat steps 2-3 for as many repetitions as are desired. 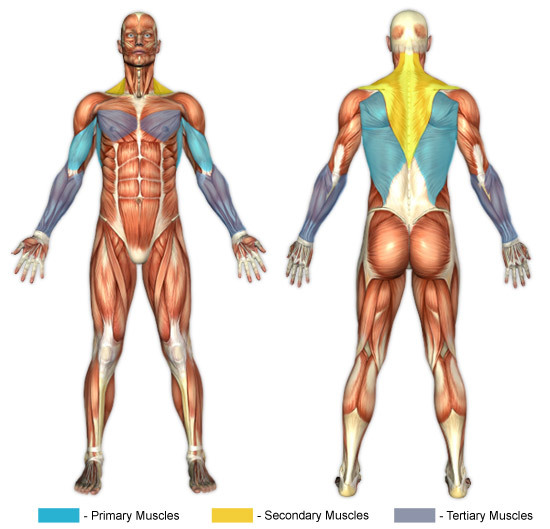 The primary muscles worked by reverse pull-ups are the latissimus dorsi, teres major and biceps. Additionally, when the shoulder blades are squeezed together at the end of the movement, both the trapezius (lower and middle) and the rhomboids are recruited. This squeeze is necessary for the entire bulk of the back to be worked with this exercise. The reverse grip of this exercise significantly recruits the biceps (biceps brachii and brachialis), though the back is still very much at work. If back emphasis is desired (whether it be to work at a v-taper appearance or overall back mass), traditional pull-ups are preferred. See "Pull-Up / Chin-Up". The wider grip allowed by traditional pull-ups promotes the width of the upper portion of the lats (thus creating or enhancing the often desired v-taper appearance). Pull-ups are prime among back exercises, however, they are not a particularly easy exercise, and as such many people may not be able to perform them. This is okay because most gyms have a machine that provides aid for this very problem. The machine is an assisted pull-up/dip machine. It works by removing part of one's body weight so as to make the pull-ups doable. Specifically, a pad, which is connected through a cable to weighted plates (which is set to the lifter's choosing), goes beneath the knees and removes a percentage of weight from each pull-up, thereby making the lift possible. For those that desire a greater challenge (i.e. a more intense lift), a weighted (dip) belt may be used to add weight to the lifter's weight. In this manner, the exercise maybe be made to be as difficult as one desires; one could add 5 pounds or 150 pounds to their body weight, for example. See "Dip Belt" for a picture of this equipment.